Putin makes his crafty strategies about Syria in public at the United Nations. Back in Russia, he is shrewdly pursuing many of the economic modernization policies initiated by his predecessor, Russia's third president Dmitry Medvedev (2008-2012). For example, Putin is continuing Russia's move into renewable energy that began several years earlier as part of Medvedev's effort to diversify Russia's economy away from natural resources. The biggest sign that renewable energy is a viable part for Russia's energy landscape is the practical interest in this sector from Russia's savviest businessmen - the oligarchs who always follow the BIG money. Viktor Vekselberg is one of Russia's richest men with estimated net worth of nearly $14 billion, whose main corporate vehicle, Renova, controls a broad array of companies in several industries. Several years ago, Renova established a business relationship with solar system designer and manufacturer Hevel. The venture quickly got off the ground, and it currently aims to invest $450 million in solar technology in the next three years. Hevel has three solar farms already operating and just opened (2015) a solar panel manufacturing plant. The Russian renewable energy sector attracted the attention of other industrial groups, both private and state owned. 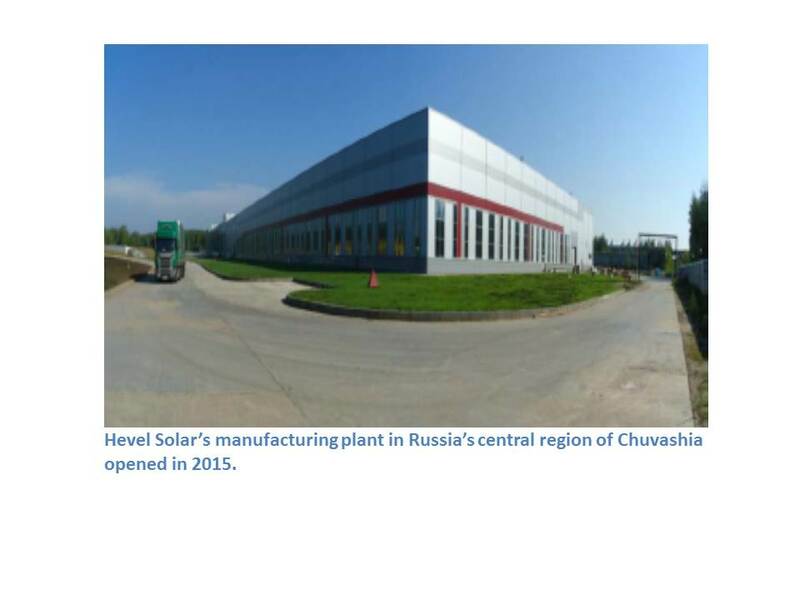 Rosnano, Russia's well-funded state owned corporation made solar energy manufacturing, installation and operations one of its high priorities as an investor in Hevel. The Russian solar sector is attracting international investor attention. In late 2014, China's Solar Systems, the subsidiary of Chinese electric equipment maker Amur Sirius, announced plans to invest up to $1 billion in the Russian solar energy projects. Three projects with the total capacity of 175 MW are already under constructions, and the construction of a solar panel factory is now under consideration. China's interest in the Russian solar market is based upon the potential of the Russian internal electricity market. But China's attention to Russia's wind resources is based upon its external export potential to China. Russia's best wind areas located off the Pacific Coast, which are close to China's heavily polluted North Eastern provinces of Heilongjiang and Jilin. Russia's Energy Ministry recently announced that Russia and China are exploring the installation of 50 GW wind power stations in the Russian Far East. Furthermore China's State Grid Corp has signed a pact with the Russian Energy Agency for building high-voltage transmission lines which has been the key problem in China transmitting its renewable energy power generation from solar and wind in the west to the cities in eastern China. In many early alternative energy projects, Russia relied on imported technology and equipment. But this is changing. Russia quickly moved into manufacturing using its R&D resources. For example, Vekselberg's Hevel venture includes both a manufacturing plant and a research institute. Russia needs to play catch-up with the established and new players in the renewable energy sectors, such as Germany and China respectively. However Russia is not starting from ground zero. Russia certainly has the scientific and industrial skills to produce solar and wind equipment. In fact, from its Soviet Union (USSR) past, Russia inherited a record of groundbreaking achievements in renewable and alternative energy systems. For example, in the 1930s, USSR was the first nation in the world to construct utility-scale wind turbines. In the 1960s, the Soviet Union opened a tidal electric plant and took the global lead in building geothermal power plants, even before Iceland became the leader today with 93% of its nation energy generated from geothermal and hydroelectric power sources. There are currently around 100 MW of geothermal power plants operating in Russia, and about 55 MW of planned additional capacity. Some of Russia's technological edge is unique: solar is a critical part of Russian space program. Besides, catching up with the West, establishing alternative energy systems is something that has happened in Russia historically. For example, in the process of building electrified (i.e., green) railroads Russia started much later than the US, but then quickly took the lead. Today, 60% of Russia's railway systems are electrified, several times the level of the United States. As for the Western view that Russia is a backward nation in alternative energy, that depends on definition of "alternative." The data and history show that this is only true if alternative is defined only as wind and solar. For example, by including hydro-electric power from dams, Russia generates 17% of its energy from renewable sources, compared to 12% in the US. It would be wrong to expect Russia's energy industry to resemble either Germany or the United States. Russia will take its own path in the alternative energy field with renewable energy leading the way. But renewable energy is still in its early days. In particular there are plenty of innovations that will surely occur in renewable energy. Some renewable energy sources such as wind and solar are "intermittent" or not stable "base" load energy sources. Thus energy storage is critical for dependable base load power through new technologies beyond batteries such as fuel cells, hydrogen cars, and smart green cities. In many of these areas, Russia has the potential to jump into the lead. Provided, of course, that national politics does not get in the way. Until 2008, Russia had no laws in place that would encourage the development of alternative and particularly renewable energy. But when the reform minded President Medvedev came into the office in May 2008, it changed. In January 2009, Russia's energy plan included the mandate to increase energy from renewable energy sources to 4.5%, by the year 2020, a four-fold increase. Medvedev's push for solar energy was both economic and political. It was introduced as part of Medvedev's modernization program. 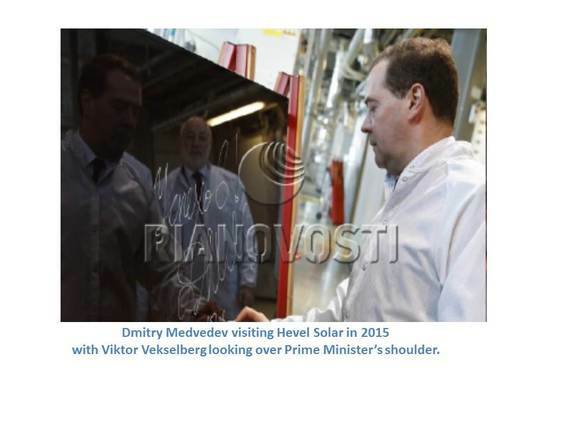 In his last days in the office as president, Medvedev incorporated solar into Russia's long-term economic policy. At Skolkovo Innovation Center, the technology business park near Moscow established as part of Medvedev's reforms, renewable energy is an important priority. For Russia, the ability to develop a viable renewable energy sector carries a special significance. Alternative energy development touches several critical aims announced by the Russian government: getting Russia off, as they say in Moscow, "the oil needle"; encouraging the economic development in regions; and developing domestic manufacturing; along with supporting technologies and systems, plus more. Creation of a new viable high tech renewable sector would be a litmus test of sorts that would show if Russia is serious about getting off of its fossil fuel resource-based economy. But there is something else to this movement toward renewable energy activity in Russia. That is Russia's former president, Dmitry Medvedev, remains politically alive. After stepping down from the presidency in 2012, Medvedev lost much of his political cache. But he managed to hang on to the job of Prime Minister, which is second in significance only to Russia's President, Putin. The development of alternative energy with a focus on renewable energy such as solar and wind has been Medvedev's brain child. The fact that Russia continues to announce renewable energy projects one after another is an encouraging sign that Medvedev retained considerable influence in the government. Russia's presidential election is three years away in 2018. Stay tuned. 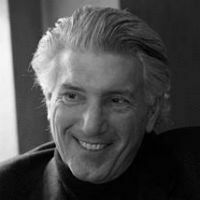 (*) Dimitri Elkin is a Russian-American businessman and writer. He is a graduate of Moscow State University and Harvard University. His book Russia Turns the Page - Historical Sketches of the End of the Post-Soviet Period 2007-2014 was recently published in Moscow.